When looking for an office chair, what features do you usually check out first? Do you specifically look for a comfortable ergonomic chair or do you look for something stylish that will add to the decor? What if you can get both in a single chair. The Amazon Basics High Back Executive Office Chair offers great comfort features without overlooking important ergonomic features to make sure that you’re in tip-top shape as you work long hours. It also has a stylish and durable built and looks good whether you use it at home or in office. This is an office chair that has received good ratings online and has received one too many recommendations. The Amazon Basics office chair may be the one you have been looking for. Let’s begin with the features that make the Amazon Basics High Back Executive Office Chair truly a stand out. Some features here like style and material, may not be that important to some as it is to you but keep in mind that buying the ideal executive office chair is considering all the best features and not just one or two. Make everyone know that you are the boss with a stylish executive chair. Sometimes it’s not enough to just have a comfortable or an ergonomic office chair but it has to have that sense of style that will make everyone know that you are important. Whether you are brainstorming with your team, updating your email or evaluating team reports, your chair should ooze that professional style. The Amazon Basics executive office chair has that high back design that will give you all-day support without breaking your sense of style. It is made from lovely bonded black leather which is one of the most stylish materials there is. The design alone looks well-thought of with the back gently cradling your hips, back, neck and shoulders. The padded armrests help you relax as well. All these good features simply tell people that you mean business and every little thing is very important to you. The Amazon Basics executive office chair is completely adjustable so it can match your comfort, style, and needs. It has a butterfly seat plate, adjustable settings, and curved back contours so you can sit with your body properly aligned. Easy controls are available to raise your seat including a pneumatic control handle that gently raises and lowers your seat. You can actually adjust this from 41.34 to 45.08 inches high. You may also tilt the back of the chair with an easy control found along the handle. You can also set it to rocking or not at all. This office chair will be your own comfortable chair that is designed and adjusted to mold and hold your body safely even for long hours. Bonded black leather is one of the most gorgeous and easy to maintain materials used to make office furniture. This office chair combines bonded black leather and PVC upholstery to create a smooth and luxurious cover over the padded seat cushion and the contoured back cushion. Aside from the seat and the back, the gently curved armrests are also padded using the same material. This impressively enhances support for the arms and comfort. Sit and relax, there’s no need to stand up and reach for your things from the back table. The Amazon Basics has 360-degree swivel and nylon casters to give you an improved versatile range of motion. It swivels 360 degrees so you can multi-task and do more work at once. The casters are very durable and let you smoothly roll along even on carpets, hardwood floors, natural stone floors, etc. And because you can easily turn and move within your office, you can do more even without leaving your seat. You will get more value out of your money with this executive office chair. It comes with a one-year limited warranty from the manufacturer. This is something that any customer should never overlook. 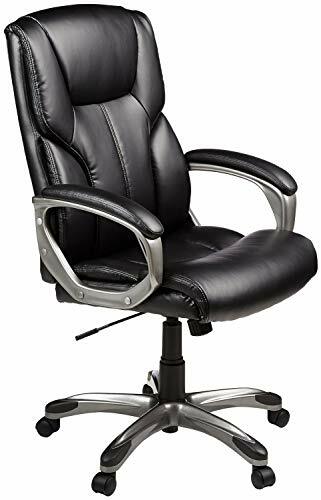 To understand the Amazon Basics High Back Executive Office Chair better, you must not just get to know its many advantages but also its disadvantages. Keep in mind these and you will never be caught off guard when you are buying an office chair or any kind of office furniture for that matter. Hope the pros and cons will help you make a better decision when buying an ergonomic office chair. If you want to learn more about the Pros and Cons, below I have details on each. This executive office chair looks and feels comfortable. I am sure you can make that out by its design. It has a high back with a deep middle and edges that seem to hold the spine, your neck, and head in just the right places. The backrest is like a cradle that gently lets your spine rest as opposed to very hard plastic or metal seats that forces your back to a specific position. The armrests are also padded which adds to the comfort. This is not a very common feature for most office chairs, therefore, this is a real plus for you. Finally, the fact that you can adjust this office chair according to your needs, you will be able to enhance your own personal comfort as you use it. The backrest lets you comfortably settle your back but still ensures that you keep proper posture especially as you sit for long hours. The armrests are just the right level, enough to let you sit and comfortably place your arm on one armrest while the other works or rests on the other armrest as well. One of a must-have feature of an executive office chair is that it should be completely adjustable. This office chair lets you sit back in comfort while considering ease of working on different tasks. The pneumatic seat height adjustment lets you easily raise or lower the seat height even while you are seated. The handle is located just below the right side of the chair. It’s so easy to use even a child can do it. Aside from raising and lowering the seat height, you can also quickly adjust the tilt of the chair. This is done by using a tilt tension knob located under the seat. This will allow the seat to rock back and forth or to stop rocking. This is made from bonded black leather and PVC upholstery. This black leather looks very luxurious and stylish which adds to the appeal of this office chair. This material is very durable and is also very easy to clean. Just wipe the surface with a dry clean cloth to remove dirt, dust, and spills. There is no doubt that this chair is very stylish. Sure you want a chair that tells everyone that you are the man, you mean business and you command respect. This comes with a high back and a classy design from the chair to the armrests. Because this office chair is stylish, it can be used not just as an office or desk chair. It looks stylish and impressive enough to be used as a meeting chair and a receptionist chair. There are a few areas where it could have been improved. None of these is a deal breaker, to be honest. There are a few things that you must understand about the Amazon Basics High Back Executive Office Chair before you purchase it. First of all, it arrives at your doorstep unassembled. You need to assemble this first before using it. If you have arranged a chair in the past, or you’re good at reading a manual and following the steps, you should not have any problem assembling it. It does not come with tools so you must have at least a screwdriver to attach the parts and assemble everything. You also need tools handy in case the parts of this office chair become loose. The Amazon Basics High Back Executive Office Chair is durable and will stand the test of time. However, it can only hold up to 250 pounds of weight. People that are too large or too heavy should not try to use this chair or suffer from dangerous effects. Therefore if you are on the heavy side or you weigh more than 250 pounds then consider another office chair model or brand instead. Although this feature may not be a big deal for some, there are people who want a versatile office chair with armrests that may be lifted up. This lets you use this chair as a guitar chair or a simple office or receptionist chair. The Amazon Basics High Back office chair has non-moving armrests, therefore, you must look at other models if this is the feature you want. The Amazon Basics High Back Executive Office Chair is stylish, ergonomic and made of widely-popular and durable materials. This is an office chair that commands attention because of its stylish design. It is the kind that will cradle your back, hips, shoulders, and head for total comfort and will not easily fade, scratch or become out of shape even when regularly used. It may not be for people who are heavier and does not have movable armrests but still, its many benefits outweigh these disadvantages. It is a good executive office chair to try.